Neck of lamb is a cheaper cut of meat, but no less delicious if cooked long and slow with plenty of seasoning. Heat the oil in a heavy-based saucepan. Add the lamb and allow it to sizzle and spit, turning occasionally until lightly browned all over. Add the lemon juice, thyme, water or stock, a little salt and plenty of pepper. Bring to the boil then turn down the heat to a gentle simmer and place a lid on the pan. Cook gently, turning the meat over occasionally, for about 50 minutes, until the meat is tender. 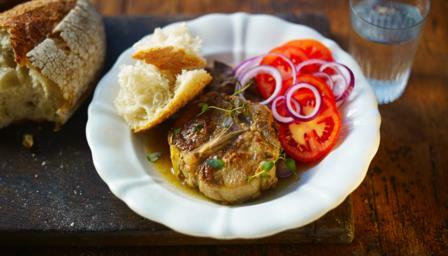 Serve with plenty of good white bread and a perhaps a simple Greek style tomato and onion salad.